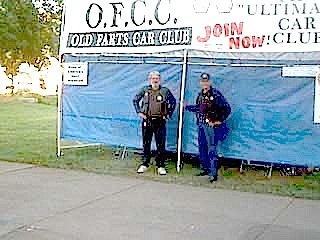 Members in the original Old Farts Car Club from the state of Minnesota. This the only existing roster that we could find for the Old Farts Car Club from the state of Minnesota. Below are the names from the state of Minnesota. See if your name is on the this roster. Many Minnesotians came to Florida for the winter and picked up valuable speed tips. Mike Strusinski shall be forever remembered because he brought doughnuts and coffee to the crew at the tent at the ''Back to the Fifties''. At the infamous Old Farts Car Club tent at the grounds of the fabulous Minnesota Strret Rod Association's ''Back to the Fifties'' extravaganza. That year, there over 8,000 entries. We would like to come back to the ''Back to the Fifties'' with another ''Senile Safari'' as soon as the ststute of limitations runs out.